Close bosom-friend of the maturing sun." 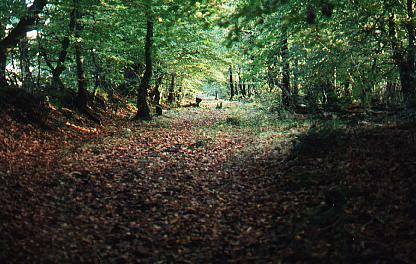 John Keats - "To Autumn"
Welcome to Quoditch Moor Nature Reserve in October. We hope you enjoy your ramble through our land. It's very wet, slippery and muddy at the moment, so you'll need to put on your Wellingtons before you go much further. 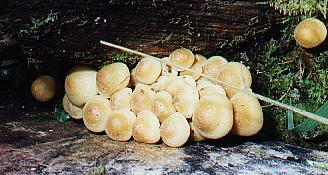 This is Sulphur Tuft fungus (Hypholoma fasciculare) which is quite common and can be found growing in clumps on old wood. This is on some wood that has been put to one side for firewood. 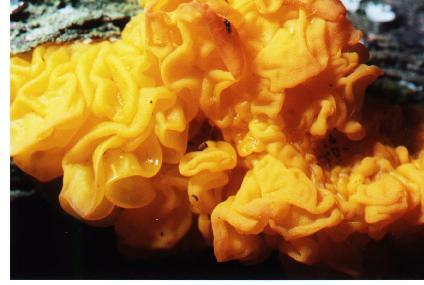 This is Yellow Brain Fungus (Tremella mesenterica). This is on the branch of a tree about twenty five yards to the left of the gate. and is alongside a patch of lichen. Field One has been well grazed by the cows and by the middle of the month they will have gone to their winter quarters. 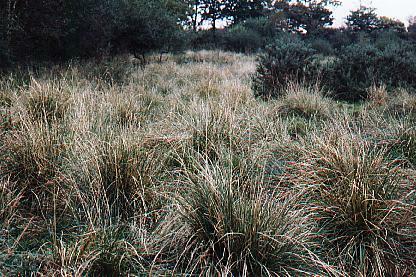 Although they have been chomping away furiously there are still a few patches of purple moor grass (Molinia) in the field towards the bottom edge. Later in the year this will have been bleached to almost a white shade. 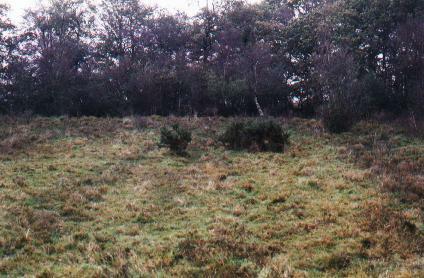 In 2004 we used ponies for our grazing. By the end of October they were developing their winter coats. Now turn right towards the bottom of the field and you will find yourself in The Ride. This goes all the way along the whole length of the site and you can branch left into any of the separate enclosures. As you can see, the leaves are starting to fall, but be careful, the ride is very muddy at the moment and it is a lot squelchier and deeper than it appears. The badgers have been busy in the bank alongside the ride. Field Two is especially wet at the moment. The cattle have trimmed the grass down to a manageable length. At some time in the year we need it to be at a height of less than six inches to allow the other plants to grow. 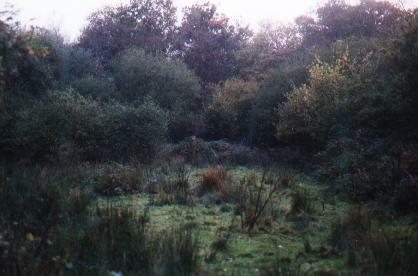 You can understand why the land is also called Culm Wetland. 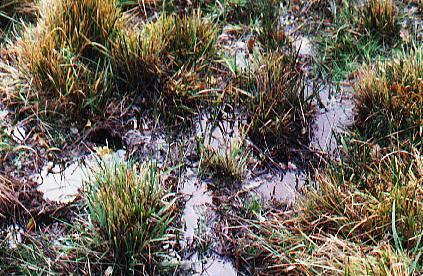 Puddles have formed where the cattle have trodden in between the clumps of Molinia grass. But this will do it some good. The cattle's hooves push seeds down into the soil, helping new plants to grow. After the foot and mouth epidemic the field wasn't grazed for a while. So here it is in a different October. 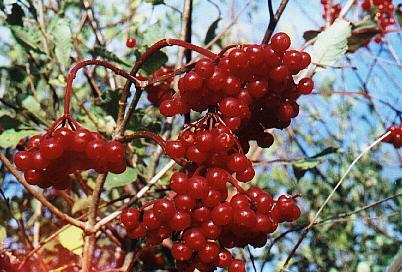 In the middle towards the west end is a Guelder Rose (Viburnum Opulus) tree covered in berries. 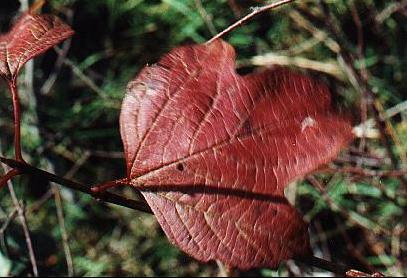 The leaves have turned to a beautiful russet colour and have a shiny, leathery texture. Field three, although staying green, now looks quite dull, because it loses the sun for much of the day. Once the sun starts dropping in the sky the trees shield the field from the sun's rays. At this time of the year to continue your walk it's easier to go back into the ride, turn left and then when you come level with the field turn left again. 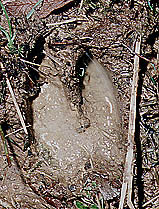 Click on the deer's footprint to continue on to field four. 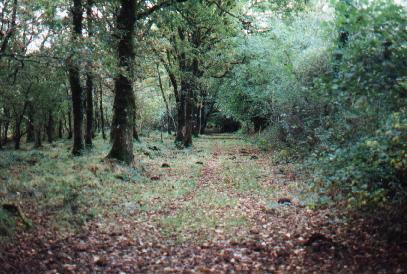 Return to main walks page. PHOTOGRAPHS on this web site may be freely used for non-profitmaking educational purposes. For other uses please contact us.